In the early morning of February 7, the Italian police started with the eviction of the Asilo Occupato squat in Turin. Five people continued to resist on the roof and came down after 30 hours. The building has now been evicted. The eviction takes place in a broader context of repression: seven people have been arrested under suspicion of involvement in a subversive organisation. Originally published by Indymedia NL. Edited machine translation by Enough 14. The arrests and eviction are the result of repression against the fight against deportation centers, the so-called CIE (Identification and Deportation Center), which are now being renamed CPR (Repatriation Center) by the Salvini-Di Maio government. 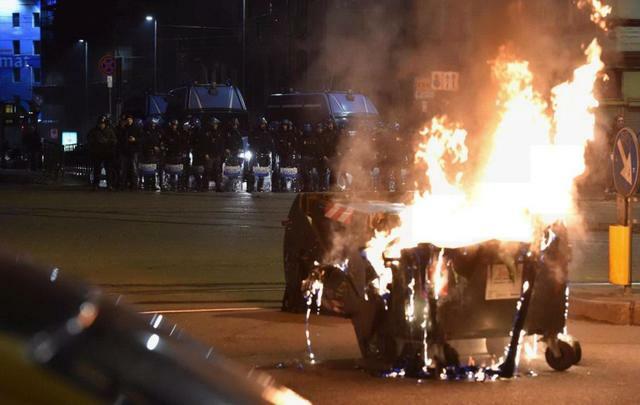 The charges of subversive association or organisation against anarchists are common in Italy. The state also has certain articles of law and legal methods at its disposal that are not applicable or unknown in other European countries. From the very first moment that the police began to banging at the Asilo door, resistance started. Five people climbed on the roof of the building and stayed there for a total of 30 hours. The anarchist radio station Radio Blackout spreaded the news of the eviction and people rushed to Via Alessandria where the squat was located. The eviction is also an attack on anarchist structures and soon there was a reaction against the repression of the state. Over two days, various actions, disturbances and confrontations with the police took place in the city. On Saturday, February 9th, 1000 people marched through the city center of Turin in the direction of Via Alessandria in order to recognize the building, they were stopped by the police. After that riots broke out. As usual the vultures of politics rushed to express their opinion. Some of the “Five Star Movement” (M5S), the party of Di Maio, tried to express their sympathy and solidarity with the anarchists of Asilo Occupato, who were hardly or not impressed. Others such as Minister of the Interior and Lega leader Matteo Salvini could not control their joy. He makes a link between migration restriction and the extermination of anarchist buildings, social centres, etc. He proudly stated: “we have pushed the landings of migrants by boat back to almost zero, now we will close the social centers visited by criminals!